Today (Tuesday, February 5th) multiple refugee and immigrant leaders will be present at the State of the Union as guests of Members of Congress. These guests will represent the millions of people across the U.S. whose lives have been impacted by the U.S. Refugee Admissions Program, which has been significantly dismantled over the past two years. One of the guests is LFSRM team member, Awn Sian Mung (Mungsan). Mungsan is a former refugee from Myanmar (Burma) who was initially resettled in Colorado in 2011. He now serves as a Lead Case Manager for LFSRM in Albuquerque, New Mexico. Mungsan voted for the first time this past November. He will be a guest of Congressman Ben Ray Luján (NM-3). 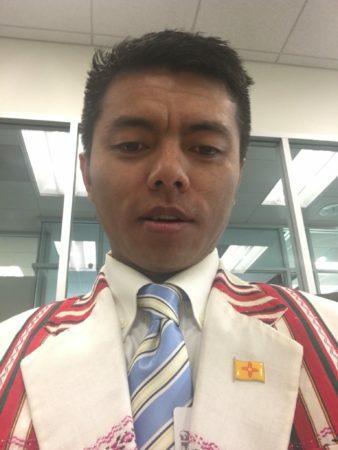 Not only will Mungsan attend the SoTU, but he will also be meeting with New Mexico’s senior Senator Udall and Reps. Haaland and Torres-Small tomorrow. LIRS will be chronicling Mungsan’s experience on social media (we will also be posting their updates to our site) – you can get the behind the scenes details by following LIRS or LFSRM on both Facebook and Twitter. LIRS has also created a website dedicated to the voices and visions for America – Mungsang’s story was added today. You can view it at https://www.lirs.org/my-america/. We are very excited for Mungsan. His sparkling personality and passion for the United States and the people he serves through LFSRM will definitely shine through tonight!